This year, I planted Mammoth Sunflowers in the corner of the parking strip to hide the unsightly telephone pole. They’re now blooming, and they’re amazing! 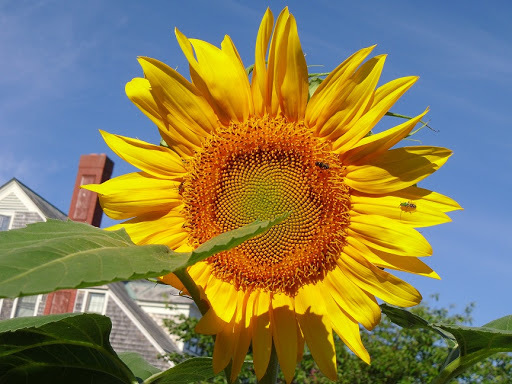 The Mammoth Sunflower (Helianthus annuus ‘mammoth’) is the grand daddy of all sunflowers rising up to 8-12 feet in height with a huge sunflower head. A note on these sunflowers is that when they mature, they always face east, so think about where you want to plant them. Not only are these flowers good for harvesting sunflowers seeds, but they are beautiful as well. And if you don’t mind sharing the sunflower seeds, you will find plenty of birds coming to your yard to enjoy them. These flowers are a BIG hit with the neighborhood kids as well. The Mammoth Sunflower is a type of plant that can’t be missed or ignored! If you want to dramatically change the way your yard looks this is a very simple and fun way to do it.